The small village community of Hampton Lucy are looking to invest in a sustainable source of electric power, to be run from the nearby River Avon. After being approached by the local Parish Council, The University of Warwick School of engineering has offered the services of a MEng project group to complete a feasibility study of the proposed scheme and suggest methods for its realisation. The suggested scheme would be to place some form of small Hydro-Electric station on the section of the river Avon that runs through the village. This section was already modified some 200 years ago to allow a Water Mill to be placed on the river. The Mill has been recently restored and is still operating today providing flour to local businesses and tours to the public. The Mill itself consists of a simple brick and timber building housing two undershot water wheels. These wheels independently drive two large grind stones and various other small components via belt drives. The civil works for the Mill (fig.1) consist of a 300m leat (man made channel) leading directly to the Mill building from the river. The water level in the leat is controlled by to weirs, the main weir where the leat leaves the main river and a second smaller weir just before the Mill itself. It is the existence of these two weirs which produces the right conditions for a micro-hydro scheme to be implemented in this area. Figure 3 - Taken from Terry Thomas's "Notes for Initial Meeting"
The drop from point A to point C is about 0.8m over the very wide main weir and the drop from B to D is about 1.2m over the smaller weir. This makes both possible sites for a micro-hydro, H1 and H2 mark theses sites. H2 is nearer to existing low-voltage (440V) and medium voltage (3.3KV) overhead electricity lines. The only disadvantage of these sites is that the island sometimes floods in the summer so any building on it would have to be “flood proof”. The island itself was once used for agriculture but was abandoned because of the flooding problems. It is now covered in nettles and bushes making current access to H1 difficult however the land owner has said he will have a path cleared to help us survey the site. The leat is very wide, 10m or so in places, unfortunately it is partially choked by weeds, fallen trees, logs and other general river debris caught in the weeds. If all this were cleared out and the floor of the leat made level enough the length and width of the channel could produce the flow we need along with the head at the H2 site. As you look from point B toward point D the river widens into a pond and then back into a small channel before joining the main river again. 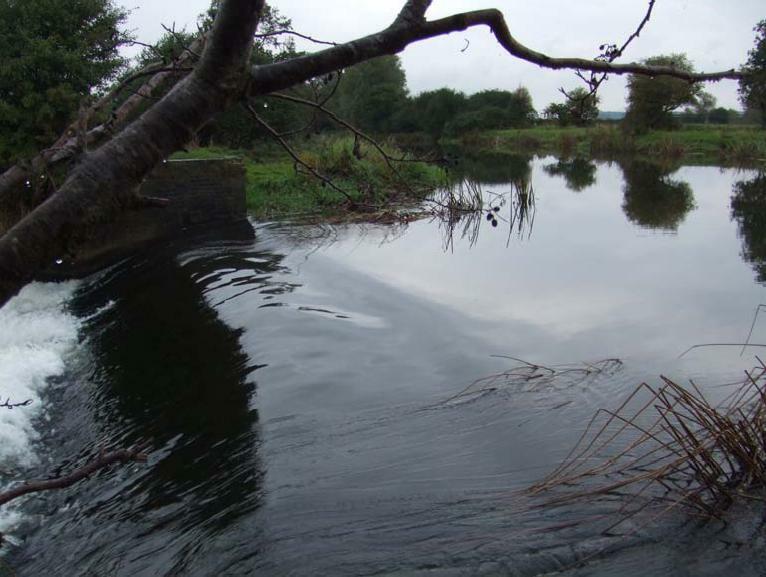 The entrance to the small channel is blocked by weeds and debris which may back up the water increasing the level in the pond. If we were to clear these weeds away too the pond may drain better and in turn its water level may drop slightly. This would increase the head at H2 assuming the weir was renovated and able to keep the water level to the mill constant. Where is the best site for a hydro plant? To answer this question we must take into account the interests of both the miller, Mr John Beddington and the farmer who uses the island. Our project could increase or decrease the risk of flooding depending on its design and it would be better that the island continued to flood rather than the Mill. We must also take into account the miller as any fall in flow could damage his business and would therefore be unacceptable. 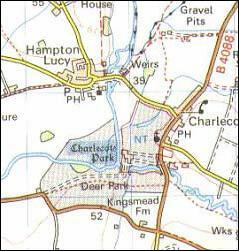 Any changes made to the river at H1 may affect fishermen in the area as the river between C and D is a popular fishing spot. Their interests must be considered too. At what flow and head should the micro-hydro be rated? Obviously this depends on which site is used but we must estimate our most likely flow and head to choose the right mechanical equipment for the job. We must also decide whether clearing the leat and pond exit is a benefit or whether the effect would be negligible. What do we do with our electricity? Should this project go ahead we could connect our supply directly to the users in the village. Is that too greater project? In which case connection to the local electricity distribution network may be more viable. What will the plant cost and how can the benefit: cost ratio (internal rate of return) be maximised? How might the plant be financed owned and managed? There are many grants available for environmentally friendly power schemes such as our own. Are any of these available to us? Does the University own this plant or does the land owner Sir Edmund Fairfax Lucy? What would be the benefits of either situation? Could the plant be combined with the mill as some form of business? Who are the stakeholders in this project? Land Owner, Farmer, Miller, Parish Council, Local Residents, Local Council? How can all their interests be accommodated in our decision making? What statutory constraints apply to the project? Who imposes those constraints? The River Authority? Finally, what should the detailed civil, mechanical and electrical design for the plant be? The Group Leader has overall project control and responsibility and is responsible for the progress of the project in line with the project plan and timeline. The Group Leader is also responsible for ensuring that safety is achieved in all aspects of the project with the assistance of the Group Safety Officer. The Group Leader is responsible for the group meeting all the project deadlines with the help of the relevant Coordinators and ensuring communication with the Project supervisors with the assistance of the Group Liaison Officer. The Group Leader is responsible for ensuring the Group Secretary produces meeting minutes and meeting agenda before each meeting. The Group Leader is required to determine the work required for the project and delegate the work to maximise project success. The Group Leader is responsible for resolving any disputes between group members. The group secretary is responsible for producing meeting agendas in coordination with the group and producing accurate meeting minutes after each meeting. All meeting agendas and signed copies of meeting minutes are to be kept together as a comprehensive record. In addition the role requires formatting and coordination of group documents to ensure continuity is maintained throughout group submissions. Responsible for contacting the relevant stakeholders including the land owner, the Parish Council, the miller, the local farming and fishing community and providing a link between them and the project group. The liaison officer will also be responsible with liaising with the project supervisor and the project group. Oversee the group budget and all group purchases following the school of engineering procedures. Responsible for the submission of Purchase Orders to Mr. Rob Olley and sending received invoices to the EUO. Responsible for the preparation and submission of the group summary Financial Report. This role will focus on the setup, maintenance and updating of any websites which the group will need during the course of the project, in order to aid in the communication between group members. It is the responsibility of the webmaster to ensure that all group members are able to share important documents and information easily and organise these files into a structured environment once they have been uploaded onto the group web space. This role also covers any miscellaneous computer related jobs, such as requesting features from the IT Services department. The safety officer is responsible for ensuring the safety of the project team members, aided by creating the Risk Assessment and Safe Scheme of Work documents. These documents are updated throughout the course of the project in relation to particular project activities. In addition to which this role also involves the production of an Emergency Contact Document that must be taken to every site visit. The poster co-ordinator is responsible for bringing all the relevant information together from all the separate areas of research and ensuring that it is produced to time. This job also includes the responsibility of arranging the printing of the poster and it’s financing with the finance officer. The poster co-ordinator will also be responsible for its presentation to the parish council. At present, we feel that we can only undertake the first two stages and as such these components have been broken down into manageable areas and been assigned to the group members who in general have the most experience in that particular area. A full listing of these and a rough idea what they comprise at this initial stage is given below. Power Usage – grid connection, mechanical use, local amenities, and household connections. Supply and Demand – Village requirements, number of houses, businesses, rates for grid connection, unit costs, plant factors, benefit: cost etc. Stakeholders – who they are, what are their legal commitments, rights, powers, what resources do they have, interests, hierarchy, statutory constraints, economics. Organisation – council owned and run, land owner subsidised etc. Effects on flooding, fishing, ecology of site, onion farmer, future effects of ‘global warming’ on scheme, carbon savings using scheme, limiting environmental impacts of the scheme, materials used etc. Flow prediction - Data from gauged points up and downstream from the site, flow duration curves, exceedence charts, rainfall records, contour maps. Flow measurements - Verification of flow prediction data, flow correlation method. Geology study - Future surface movements, soil and rock types, best position for penstock/channel/powerhouse, foundations, slope instabilities. The hydrology study, when completed should give an accurate value for the power supply potential and hence an idea as to the sizing of the penstock and the turbine the correct variable flow characteristics required from it. At this point, it is hoped that the capability and demand survey will have been completed and the group will be able to move on to the pre-feasibility study, which will obviously require reallocation of tasks. All members of the group have signed up to a forum, which is used for day to day communication, general queries, ideas, posting of small documents and links to useful texts that have been found1. There is also a formal homepage2, found at which is used for file transfer, timetabling and detailing the current status of the project. This webpage is viewable by the general public, to give an indication as to what the objectives of the project are and how well they have been realised.